Lancelyns have been lords of the manor of Poulton-Lancelyn and Lower Bebington since before records began in 1093, when Scirard (Shire Warden) de Launcelyn gave the Chapel of Bebintoun (St Andrews) to the Abbey of St Werburgh (Chester Cathedral). The present Scirard is the 32nd lord of the manor and his son Randal will be the 33rd. The castle, whose site is mentioned on maps well into the last century, was probably a wooden fortification on stone foundations, overlooking the junction of the Clatter brook with the Dibbin stream - to watch out for Viking invaders. The millennium barn was built in 2000 on its remains. It has a mezzanine floor with a gallery for musicians, a small kitchen, fire and WC, and is available for events such as art exhibitions, parties and small concerts. The present house was built in 1652 by Richard Greene, apparently on the foundations and remains of a previous one. It is built of brick (the previous one presumably was wooden and burned down) with stone coigns and clad in stucco, which when it fell off was replaced with pebble dash, which remains. The first extension to the original L-shaped building was added by Priscilla Lancelyn Green in 1720 (mother of the very young squire Neddy) for her brother-in-law Thomas, Rector of Woodchurch, to house his library (and install some plumbing). The larger extension came in 1850, when the heiress Harriet Lough needed to house her Victorian servants, with bedrooms, dining hall, night nursery and lots more plumbing. The brewhouse and cowshed (shippon) and cottages for groundsman, gamekeeper, housekeeper and gardener were built, and eventually the family couldn’t afford to educate 8 children, so hastily added a billiards room in 1870 in order to let the house and move to Guernsey, where education was cheaper. Roger and June Lancelyn Green added two more bathrooms and kitchens onto the end of the house in the 1960’s, to enable the Victorian servants’ quarters to be rented out as separate flats. 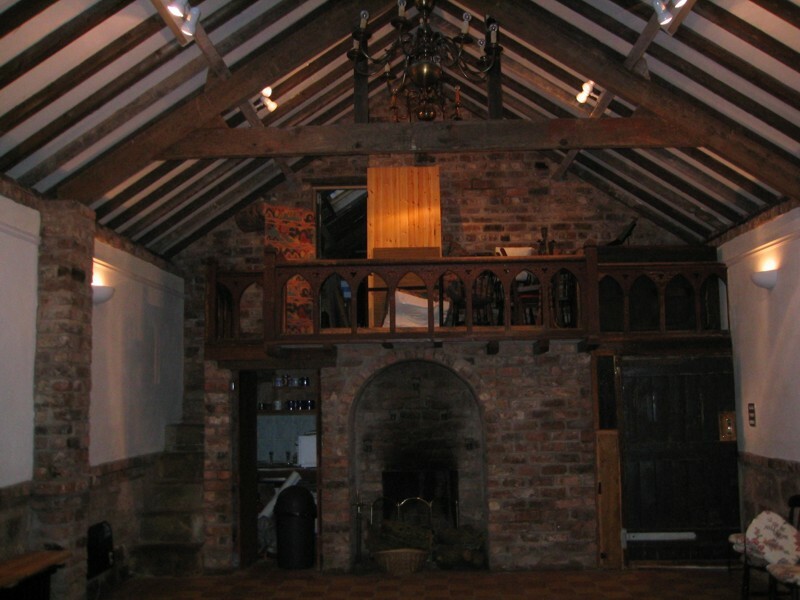 Scirard, the present squire, extended the billiards room to house a three-manual pipe organ, with storage for tables and chairs and musical instruments and sheet music, to enable it function as a music room and entertainment space.